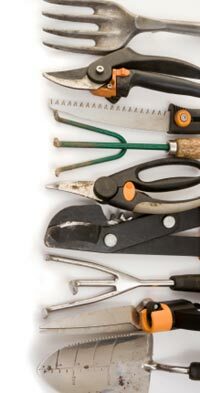 Choosing gardening tools that are well-manufactured and made of high-grade materials will be worth any extra expense. Look for tools with easy to clean rustproof metal parts. Stainless steel tools are a good buy. Also, look for tools that have replaceable parts in case of breakage or damage to the item. Another handy feature to look for would be holes in the handles. The holes will allow you to hang up your tools when not in use. There are many wonderful gardening implements available. Some are essential tools that are needed for taking care of any gardening area. a garden cart or wheelbarrow for hauling heavy or bulky items. a gardening stool to ease some bending tasks. You may even find other gardening implements to enhance your planting experience. Remember to always buy good quality equipment for your gardening needs. If you purchase cheaply made items, you may find yourself needing to replace often the ones that bend or break easily. This can quickly become quite costly. In the long run, the little extra you may need to pay for well-made gardening equipment will result in many good years of use and plenty of gardening enjoyment. And besides which, you deserve it! Hold tools with as light a grip as possible, trying to avoid a sustained tight grip. Alternate gardening tasks to avoid injury and stiffness to any one area of your body.